Pre Bays, their albums were formed almost entirely on the road; the songs slowly evolving live at festivals such as WOMAD UK, SONAR, Bestival, Lowlands, DEMF, Pukkelpop, Glastonbury, The Big Chill and Roskilde. Stand alone concerts also feature heavily, with sell-out mayhem ensuing at Alexandra Palace and Brixton Academy (LDN), Paradiso (Amsterdam), Vega (Copenhagen), The Coliseum (Lisbon), Henry Fonda Theatre (Los Angeles), Columbiahalle (Berlin), Sydney Opera House, and Le Zenith (Paris). Not many bands have been so strategic in their approach to their long-term career. Creating a blueprint with a global perspective, the band have consolidated their fanbases across Europe and the UK with high profile performances accompanied by slow burn albums that reveal more and more with every listen, priming the fan for the next live experience. It’s about the long game, a path that has come about by careful stylistic evolution, ever increasing production values and a live reputation that precedes their recorded material. People of the world shake it loose with Freddy's Live At The Roundhouse, a two-part radio special broadcasting over the next two weekends on Radio New Zealand National Radio. 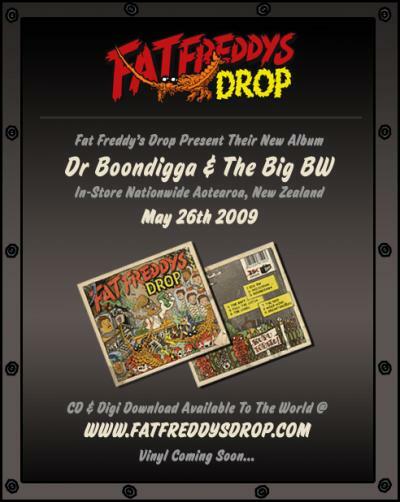 Part One kicks off around 4.30PM (NZ time) this Saturday 28 March on Music 101 with horn man Sugar2Tone introducing the Australasian debut of Fat Freddy's Drop Live at the Roundhouse in London, the finale of the Big BW tour in December 2008. As Joe Dukie (pictured at the Roundhouse - photo by Eric Wang) told the people at the sold out finale, Freddy's brings the music from 'under a beautiful New Zealand blue sky' and he said 'we try and play from the heart at every gig'. Preceding the live recording at 4.00PM catch Fat Freddys Drop's guitarist Tehimana Kerr a.k.a. Jetlag Johnson talking about his solo album Defamation of Character. Part Two of Live at The Roundhouse plays at 4.30PM (NZ time) next Saturday 4 April, followed by a bumper edition at 11PM (NZ time) Friday 10 April. Presented by Niche Productions, the magnificent Fat Freddy's Drop return to Australia in March for a series of heart-stopping shows that could deliver the answer to the question on fans lips worldwide - is the album out yet!? For the past three years, the New Zealand band has been conquering the globe with a slow burning boil up of hi-tek soul, jazz and reggae, road testing new songs for the follow up to their record breaking debut Based On A True Story and fielding album requests from fans in Europe, UK, USA and Australasia. In 2009 Freddy is getting ready to pull the catch on the sophomore album Big BW and shake that 'shiverman loose'. Fat Freddy's Drop was last in Australia around New Year for Days Like This! festival in Sydney and they played at Pyramid Festival on Philip Island - until stage crew had to physically remove the musicians mid-set as rain and wind battered the stage. Freddy's legion on the tour in March features two fresh faces that have melded seamlessly into the already seven strong jam heavy band - the rhythmic Riki Gooch on drums and the rock with the baritone voice Rio Hunuki Hemopo on backing vocals and bass. Rio Hunuki Hemopo will also play opening support for Freddy's on the Australian tour. Joined by guitarist Justin 'Firefly' Clarke, his set will include tunes from his debut 12" vinyl release Wahine Toa that was produced with DJ Fitchie at the Drop in Lyall Bay, Wellington. The Drop studio by the Pacific Ocean is where Freddy's has been recording Big BW. To date two tracks have been let out the bag - The Camel (ft Alice Russell) and Pull The Catch. The release date for the full album is close - the crowds are ravenous. Is there anyone else out there overwhelmed with the success of this wicked band? Such has been the demand for tickets to the Wellington Fat Freddy's Drop show on Saturday 23 July, at Shed 6, that another show has been added on Sunday Friday 22 July. Get in quick, though, as this show is likely to sell out too. Aucklanders without tickets to Saturday 16 July at the Civic should already be scouring Tradme, as that show has also sold out, and the tickets for the gigs in Wanaka, Dunedin and Christchurch are going fast. Fat Freddy's Drop Nominated For B.Net Awards!